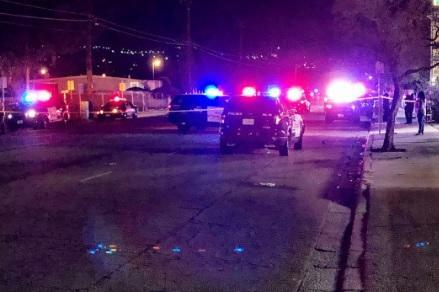 SAN BERNARDINO, Calif. -- Eight people were wounded in a shootout at a Southern California apartment complex late Sunday night, CBS Los Angeles reports. Three were in critical condition, San Bernardino police said. Police initially said 10 were wounded in the shooting and later lowered the number to eight. Most of the victims are adults; one is 17 years old. Police say several people were playing dice in a common area of the complex when the shooting happened. At least one person approached the group and opened fire. Investigators said they believe some of the people at the game may have returned fire. Multiple handguns and rifles were fired, they said. The incident didn't appear to be terrorist-related, investigators said. Neighbors told CBS L.A. the area is gang territory. No arrests have been announced. Witnesses told the station they heard what sounded like 30 shots, possibly more. Some stray bullets went into apartments but no one inside was hit, police said. There was a heavy police presence at the scene in the immediate aftermath of the shooting. San Bernardino is about 50 miles northeast of L.A.